Setting up the environment right is what often goes wrong. 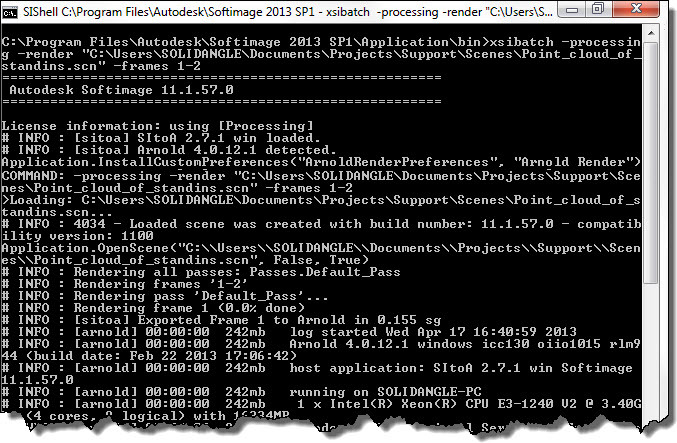 Running kick -licensecheck from inside Softimage is a quick way to check that you set up the environment variables correctly. Here’s two lines of Python that will open a command prompt and run kick -licensecheck (on Windows). In this example, I’m running Maya and the license server on the same computer. 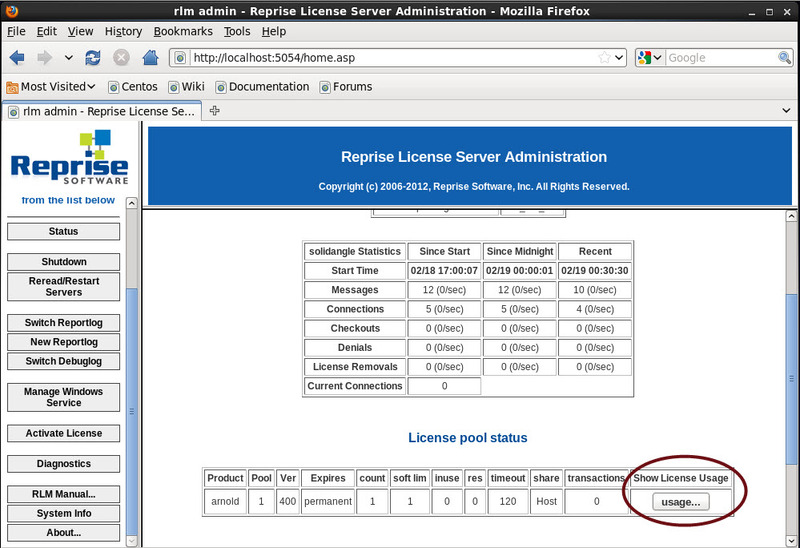 That’s why none of the environment variables are set, but the licensecheck still shows that there’s a license available. By default, Arnold will connect to 5053@localhost to get a license. SITOA_AddMaterial takes the shader family (for example, Material or Texture) and the name of a shader, and connects that shader to the surface port on the Material node. 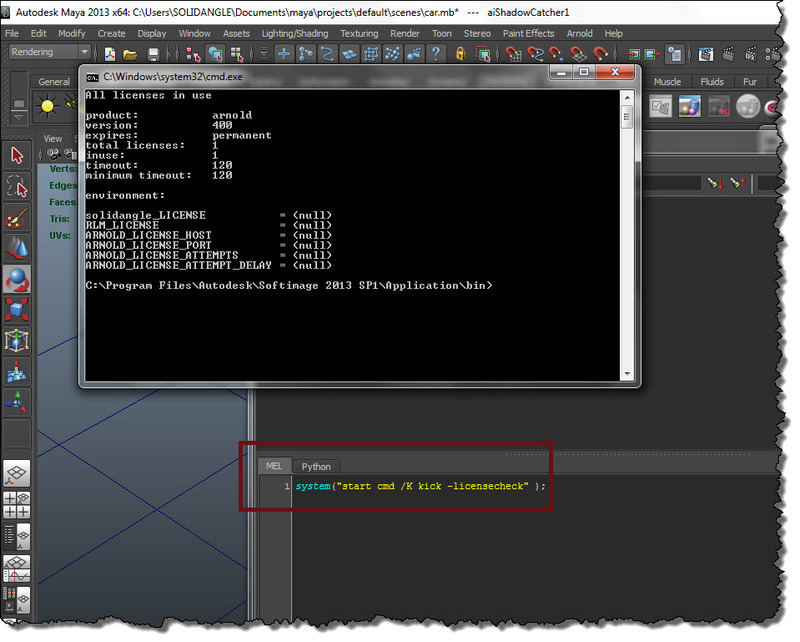 SITOA_AddShader is similar, but it also takes a connection point as an argument, so you can connect to a specific port, such as the Environment or Displacement port. You could write your own function with X3DObject.AddMaterial. Here’s the simplest possible version. I don’t specify the path to a preset, just the name of the shader. That’s not terribly efficient, because Softimage now has to search for the preset (and that took about 0.2 seconds on my machine). Here’s a version that builds the path to the preset (just like the SITOA commands do), but that doesn’t require the shader family, just the name of the shader. 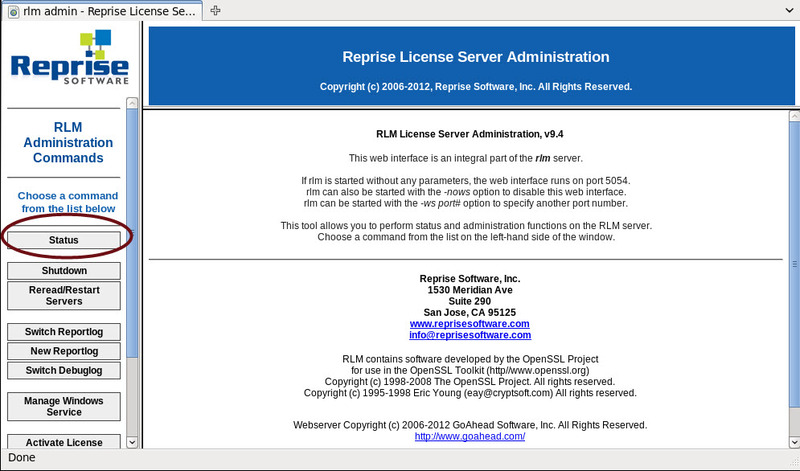 In this case, a customer reported that the license server wasn’t releasing licenses when a render node crashed. Why did this happen? Because the customer had an older version of the license server that didn’t have a license TIMEOUT. 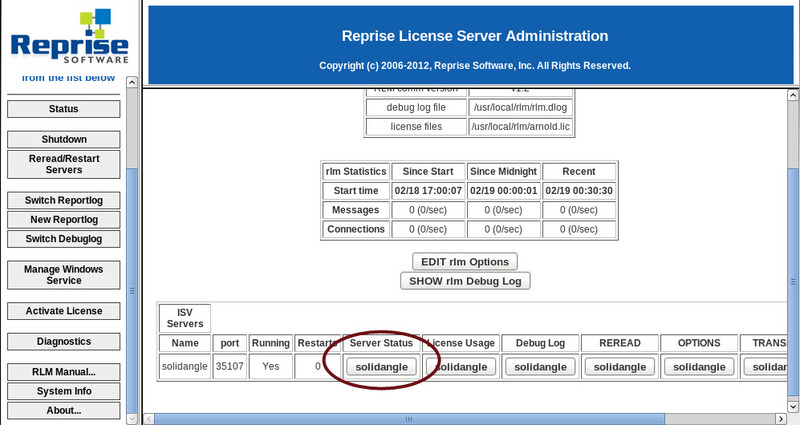 Since early 2012, the Solid Angle license server ships with a default TIMEOUT of 120 seconds. That means if a workstation stops sending heartbeats to the license server, then after two minutes the license server takes back the license. So, for example, if a workstation crashes or disconnects from the network, then the license server will take back the license after a couple of minutes. You’ll need to restart the server to read the new options. What are heartbeats? Heartbeats are messages sent from a licensed application to the license server while the application has one or more licenses checked out from the server. You can see them with Process Monitor. 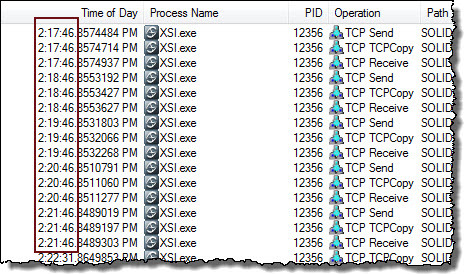 In this screenshot, you can see that XSI.exe is sending a heartbeat every one minute to the license server. If you need to free a checked out license, you can “remove” it (that’s RLM-speak for taking back a checked out license). Under Server Status, click solidangle. 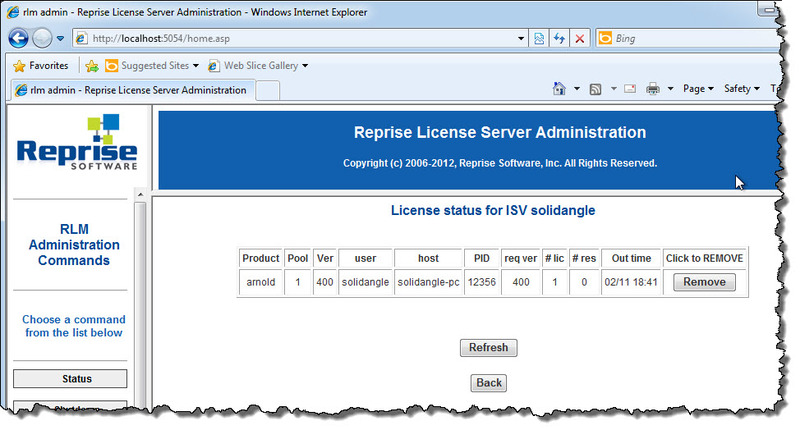 Under Show License Usage, click Usage.